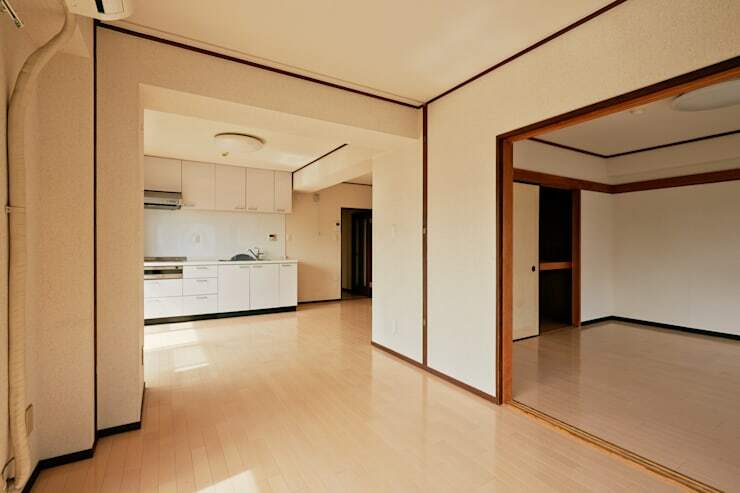 Modern Japanese homes are cleverly planned and designed along simultaneously functional and tasteful lines. The lavish use of wood and an understated palette is another feature which stands out in such abodes. 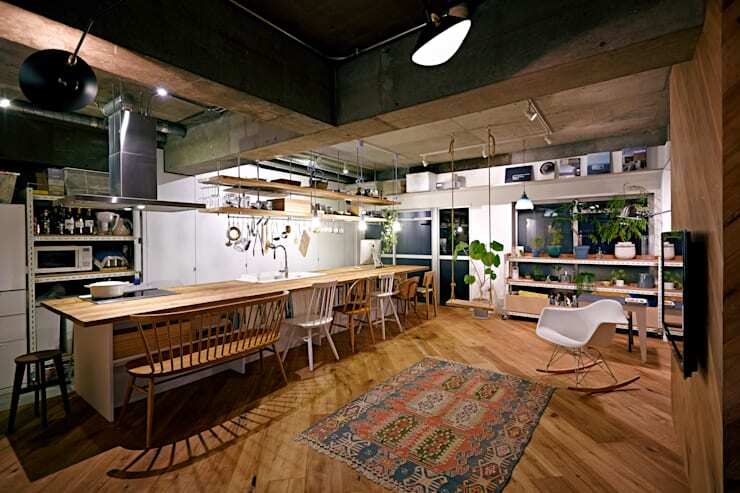 Moreover, contemporary Japanese homes increasingly embrace current trends in design and decor, whilst remaining connected with tradition. So today, .8 House is the abode that caught our eye with its distinctly industrial chic decor and practical ideas. 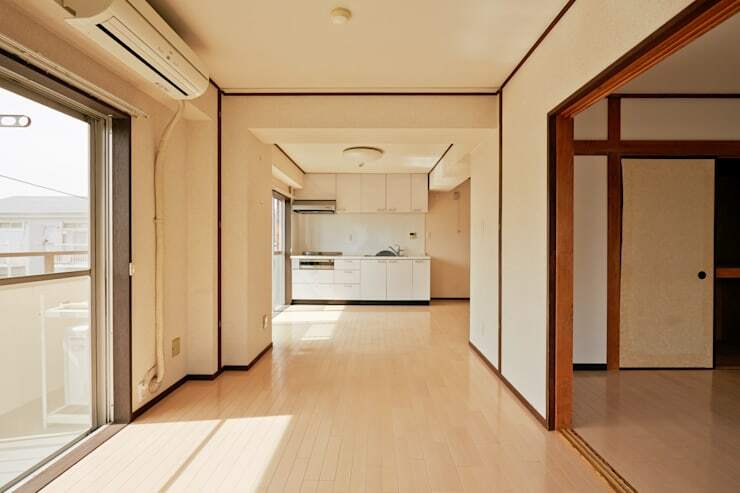 Prior to the makeover by .8 / Tenhachi, architects from Kanagawa, this house was a stark and unappealing living space which needed livening up. So here’s how the metamorphosis happened! The home was a simple space with uninspiring cream-hued walls and flooring which lacked visual interest. There was a distinct feeling of emptiness and monotony which did nothing to add to its appeal. Outdated kitchen fittings completed the bleak look. A change in plans as far as the kitchen layout was concerned has now transformed the look and feel of the home’s interiors. 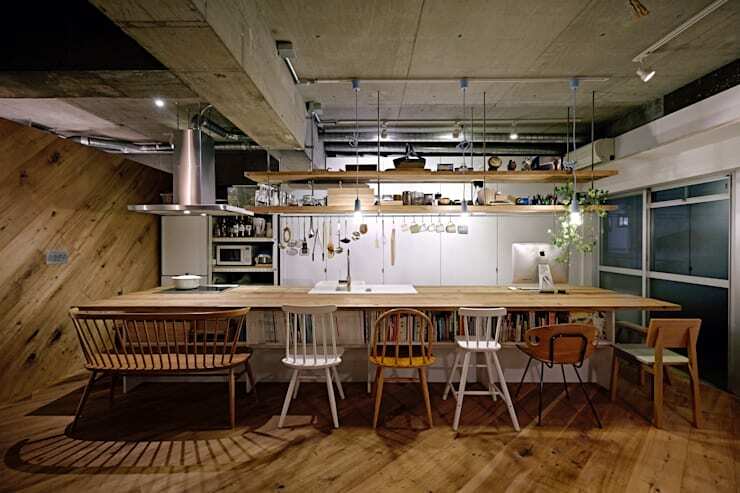 The kitchen exudes a neat yet playful warehouse-like vibe that shows off its expansive corners. 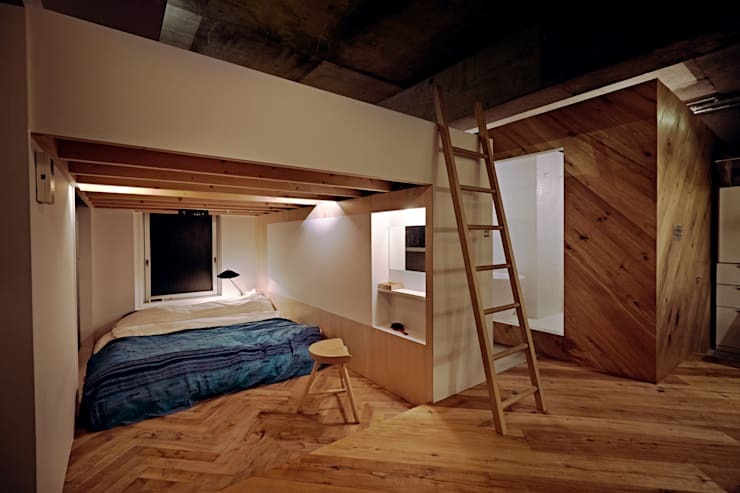 The interesting wooden flooring breaks the monotony of white walls, and is helped by the concrete and wooden ceiling too. A colourful rug adds fun to the entire ambience. Lush indoor greens dot the corners of this space for an organic finish. Post makeover, the kitchen is now an industrially-inspired space where functionality, fun and aesthetic delight rule. The exposed pipes and racks hanging from the ceiling add to the modern style quotient, and are complemented nicely by the long wooden kitchen island. Quirky mismatched high chairs lend seating options, while loading up on the fun aspect. The wall behind the island offers adequate scope for hanging crockery and cutlery, and houses chrome appliances. Bright and focused lighting seals the deal. The bedroom gives off a cosy and idyllic vibe with its warm and intriguing wooden accents which go wonderfully well with the white walls. The grains and lines on the wood add to the visual interest, while the bright blue bedspread adds a dollop of serene fun. The quirky stool and simple ladder leading to the loft are the charming and quaint elements of this space. Powerful lighting produces a soft and balmy glow which lets you relax and be yourself in this room. 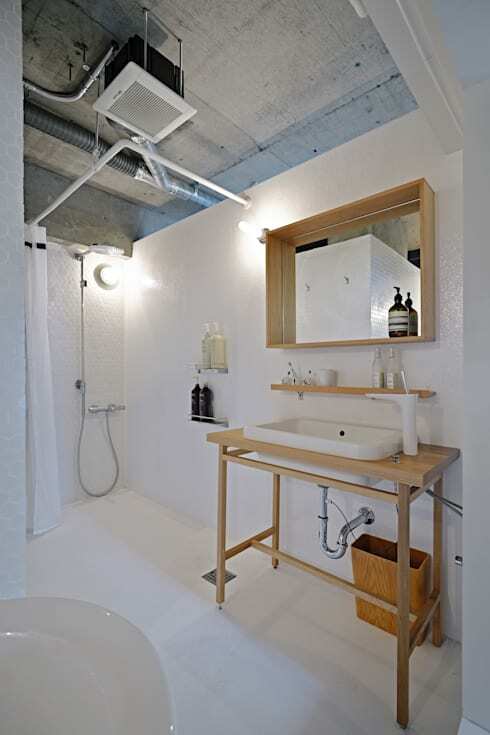 This urban chic bathroom is sure to have you swooning with pleasure. The clean white alcove accommodates a neat bathtub, while bright lighting accentuates the zig-zag grains of the wooden wall. 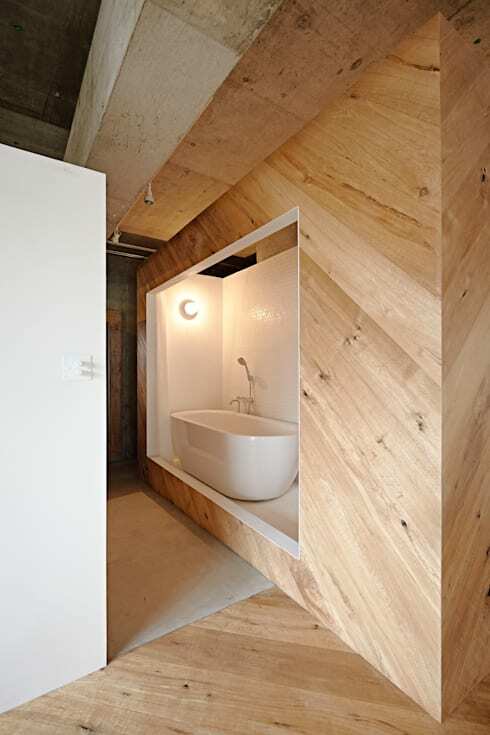 The bright and spotless white walls of the bathroom are balanced uniquely by the concrete ceiling, while wood makes its dainty presence felt here. The mirror is cleverly framed by wood so as to offer arrangement options for bottles of lotions and potions. The slim sink is embedded into the minimalistic wooden table which has storage space underneath. Sleek shelves and niches also mark the space for added storage. The shower area is chic and uncomplicated, complete with modern fixtures. A walk through this home will make you feel cocooned from the realities of city life, as simple, industrial designs bring the concept of cosy living alive! Take a look at another before & after story for more inspiring ideas: From bare to beautiful: a small apartment gets arty. What do you think of the industrial decor used in this home? Can you imagine living here? Let us know!